UBI Research says that while virtually all flexible OLEDs used in smartphones today use an edge-type design (which UBI refers to as bezel-less), by next year Samsung will be able to use a flexible OLED to cover the entire smartphone screen. Such bezel-less displays will grab an almost 20% market share in 2017 (out of all flexible OLED smartphones, that is) - and this will grow to over 50% by 2020. 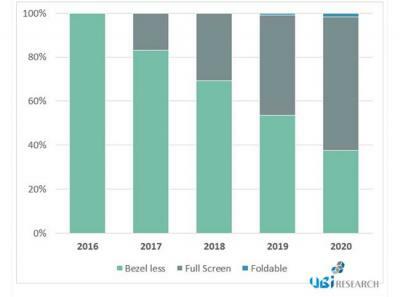 Foldable OLEDs will be the next step, and these will start to appear in 2019 - although UBI does not think foldable OLEDs will grab a meaningful market share even in 2020.